I posted about how threatening SIDS is and why safe sleep is important, which you can read here, all because this month's Nanaygosyante was really good in her advocacy. I met her one sunshiny Saturday in Shaw Boulevard, Mandaluyong City for a sparty she organized for her bloggy guests. She discussed how Halo® SleepSack® could help give your baby the safest sleep she deserves. Ivy Lim-Esteban is the mompreneur behind Halo® SleepSack® Philippines, which she started May of this year. The drive to start this business actually came up when she realized there's no one selling the product here, which she and her husband found out about when their first baby was born. She wanted to educate more Filipino parents about the threats of SIDS and that hopefully, through Halo® SleepSack® Philippines, more Filipino babies will have safe sleep. How passionate and caring is she, right? Read on and let's all find out how she is a woman, wife and mom. 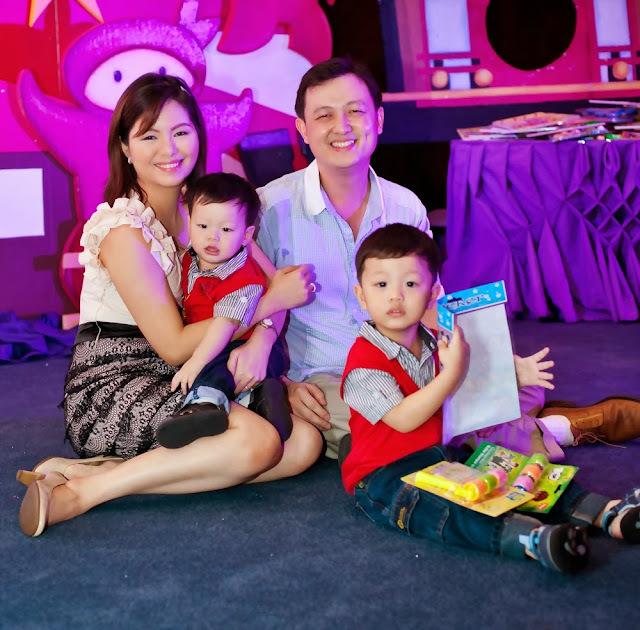 It must be tough being a mom and an entrepreneur at the same time, how do you juggle those roles well? It is very challenging to be a mom of two toddlers, a wife, and a business woman at the same time. Of course, my family is my number one priority in the world. But my work and my advocacy are equally important and there are times when I get pulled in two directions that are so important to me. Sometimes I just have to do the best I can; and understand that I can't do it all. It helps that I am a work-at-home "mom". That means I can still supervise the kids and be there for them any time they need me. But, at the same time, being a work-at-home "business woman" means that my boys can barge into my home-office any time, or call for me while I am in the middle of something. I am open to more distractions, so I couldn't get the work done as efficiently as I would have wanted. I have learned to adapt by multitasking (ex. I developed the "talent" for answering clients' texts while brisk walking on the treadmill). I also purposely set aside time for work (usually while the kids are napping), and time for my family. Lastly, I train my household staff so that I can delegate as much of the house work and prioritize things that are really important. It looks like you're a hands-on mom, are you? I am not "hands-on", in the sense that I don't get to feed my kids, bathe them, change their diapers all the time and all by myself. I would love to be able to do these for my kids, but since I am also a working mom, I purposely delegate these activities to my yayas. This allows me more time to do things that I can do best as a mom - and for me, that is being their first teacher. I make it a point to spend quality time with each of my boys every day. I purposely carve out pockets of my day for them. Since my boys are in different developmental stages, I have to set aside twice as much time so I can give each one the focus he deserves. For my 1 year old, we are at a stage where I help him explore and understand the world around him. This means showing him mundane things like how the light switch works, teaching him his first words, singing his favorite songs, and lots of cuddles! My 3-year-old loves our story-telling time, which is also my way of teaching him good values, and one of the rare times I can get him to stay put, haha! We also love doing pretend play, goofing around and simply having fun. With both my boys, I try to make learning fun and natural. I cherish and enjoy all these special moments I spend with my kids. I wouldn't trade it for anything in the world! Do you involve your husband in your business or does he let you do your own thing? My husband respects my skills as a business person and basically lets me run my own show. However, I consult with him whenever I need an honest opinion and his advice weighs heavily on each major business decision I make. My husband and I have a weekly date night every Friday. I call it my "friday fix"! :P We also have a window to ourselves every night, when the kids are asleep. This is our special time as a couple. We usually cap off the day by watching a movie. This is also when we can hold meaningful conversations, or simply enjoy being with each other. What are the usual things you do to unwind? They say that laughter is the best medicine. In my case, my children are my antidote to stress! I really enjoy being silly with them and making them laugh. Their laughter literally wipes away all my tiredness, and I feel refreshed and recharged just by spending time with them. Can you share your 2013 business goal for Halo® SleepSack® Philippines? Halo Philippines' mission for 2013 and beyond is to spread the safe sleep advocacy here in our country. In most first-world countries like the USA, safe sleep education is being pushed by the government. In fact, there are laws that mandate US hospitals to educate new parents about safe sleep prior to discharge. And I am proud to share that more than 1,200 US hospitals and NICUs are using Halo SleepSacks to model safe sleep practices. Sadly, there is still no government support and a huge lack of public education on safe sleep in the Philippines. That's why ours is a daunting task. Quite frankly, there are moments when I wonder whether a simple "nanaygosyante" like me can really make a difference. 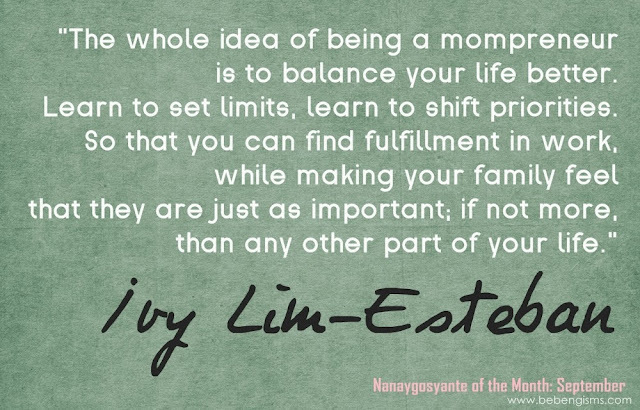 But it is also from the "nanay" in "nanaygosyante" that I find the passion to do what I do. As a mom myself, it pains me to know that parents unknowingly subject their babies to danger. It is heart-breaking to have complete strangers approach me to share stories of babies who died or almost died because of unsafe sleeping environments. At the same time, it is very encouraging to know that there are other moms (like Bebengisms) who care enough to support our safe sleep advocacy. I hope that Halo Philippines, with the support of our fellow safe sleep advocates, can help Filipino babies sleep safely - one nursery at a time! Lastly, what advice can you give our fellow moms who want to be a nanaygosyante like you? and please like them on Facebook http://www.facebook.com/halophilippines.